I can’t stop grinning whenever I remember my first elephant ride in Thailand. I never imagine that in my lifetime I would experience riding an elephant. It’s pretty scary at first because you have to climb a tree house and then “jump” to the elephant. “Jump” meaning from the tree house, you need to cautiously go to the elephant’s back with the help of the elephant “driver”. At the tree house, there’s a long queue of tourists eagerly waiting for their turn. I was so excited that I did not mind the queue at all. I waited patiently for my turn while doing some snapshots. I managed to make my way on the elephant’s back without mishap. Good thing my elephant is not rowdy… I was able to have a great time during the elephant ride while enjoying the scenery under the scorching heat of the sun. The elephant “driver” was very pleasant and offered to take my photos. He was also selling well-crafted jewelry. The jewelry is beautiful but I politely declined because I can’t afford it. A cold drink and a wet tissue were provided after the ride. 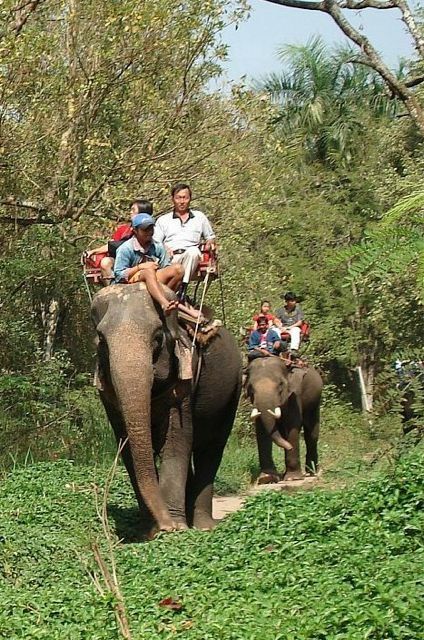 If you happen to visit Thailand or any place in the world wherein there is an elephant ride, I suggest you go for it! It’s one of the greatest lifetime experiences.